Chatting with Alec Sutherland de HautBeau in the Québec Design booth. The month of May is an exciting time of year for several reasons, one being the fact that the flowers start to bloom and the scent of lilac and lilies of the valley fill the air. Another being the warmth that starts to replace the cool winds and rainy days…well it’s supposed to anyhow…Yet another being design week in NYC! This year we got the chance to pop into NYC and check it all out (By ‘all’, I mean a fraction of all the events that go on during design week). 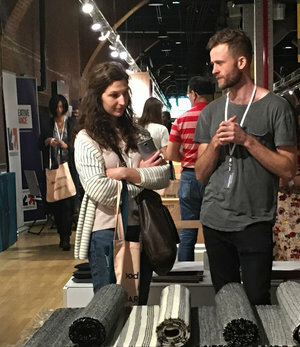 We had the good fortune of visiting 3 design shows and 2 private events during our short stay and we thought we would give you a short recap of our findings. Firstly, the location for Wanted design is quite lovely, wooden ceilings, brick walls…everything you would expect from a loft space in New York City. The atmosphere was warm and inviting and the general vibe was one that encouraged discussions and exchanges between the visitors and the presenters. There was a Québec Design stand that was of particular interest to us as it was nice to see local products represented among so much international talent. Intimate and convivial, the Wanted Design show was the first one that we visited and we were quite impressed with the international flair of it as well as the general vibe of the show. We wanted to linger and ended up doing the turn of the booths a couple of times. There were many decorative objects in playful forms and pastel colors. Many of them handmade by the presenters themselves or by local artisans. The sheer size of the show is impressive. If you go, reserve at least a half-day to fully explore the show. We thought we saw everything but when we looked at the floor plan upon returning home, we realized that we missed a whole section. It’s huge, so come prepared. The quality of the products as well as the quality of the presentation of the products was what struck us the most. We got to discover so many interesting companies from around the world as people come from far and wide to participate. We came back with so many pamphlets and business cards, the challenge now is remembering which ones we liked the most. The networking and business opportunities are abundant. We noticed a general trend towards wood furniture and bright colors, often both mixed together. There were many colorful textiles and lamps. Accents of painted metal in subtle tones were quite present. This show showcased a more artistic and experimental approach to furniture and lighting design and it was actually quite refreshing. We decided to visit Sight Unseen after ICFF, which proved to be a good choice as we got to compare the mass-produced to the experimental. The atmosphere was more raw and rugged, less business oriented and more museum-like. There was a certain ‘mise en scène’ aspect to the booths as they were carefully decorated to evoke a mood, each one quite different. We did however notice an overall nod to a post-modern theme, with all the geometric shapes and bright colors. It was a great contrast to all we had seen and a refreshing way to end our trip. All in all, it was a really enriching and inspiring 3 days. We tried to absorb as much as we could and came back refreshed and inspired. Taking part in Design Week in NYC was always something we wanted to do and we are thrilled with all the things that we discovered. For the design junkies out there, it’s definitely worth the trek. Please don't hesitate to give us your feedback, we will definitely do it all again next year!